Space Shuttle Discovery launches from NASA Kennedy Space Center Launch Pad 39A on mission STS-124 on May 31, 2008. Discovery became the third operational orbiter to enter service, preceded by Columbia and Challenger. It embarked on its last mission, STS-133, on February 24, 2011 and touched down for the final time at Kennedy Space Center on March 9, having spent a cumulative total of almost a full year in space. Discovery performed both research and International Space Station (ISS) assembly missions. It also carried the Hubble Space Telescope into orbit. Discovery was the first operational shuttle to be retired, followed by Endeavour and then Atlantis. The name Discovery was chosen to carry on a tradition based on ships of exploration, primarily HMS Discovery, one of the ships commanded by Captain James Cook during his third and final major voyage from 1776 to 1779, and Henry Hudson's Discovery, which was used in 1610–1611 to explore Hudson Bay and search for a Northwest Passage. Other ships bearing the name have included HMS Discovery of the 1875–1876 British Arctic Expedition to the North Pole and RRS Discovery, which led the 1901–1904 "Discovery Expedition" to Antarctica. Discovery launched the Hubble Space Telescope and conducted the second and third Hubble service missions. It also launched the Ulysses probe and three TDRS satellites. Twice Discovery was chosen as the "Return To Flight" Orbiter, first in 1988 after the loss of Challenger in 1986, and then again for the twin "Return To Flight" missions in July 2005 and July 2006 after the Columbia disaster in 2003. Project Mercury astronaut John Glenn, who was 77 at the time, flew with Discovery on STS-95 in 1998, making him the oldest person to go into space. Had plans to launch United States Department of Defense payloads from Vandenberg Air Force Base gone ahead, Discovery would have become the dedicated US Air Force shuttle. Its first West Coast mission, STS-62-A, was scheduled for 1986, but canceled in the aftermath of Challenger. Discovery was retired after completing its final mission, STS 133 on March 9, 2011. The spacecraft is now on display in Virginia at the Steven F. Udvar-Hazy Center, an annex of the Smithsonian Institution's National Air and Space Museum. Discovery rocketing into space, just after booster separation. Discovery weighed roughly 3600 kg (3.6t) less than Columbia when it was brought into service due to optimizations determined during the construction and testing of Enterprise, Columbia and Challenger. Discovery weighs 6 pounds (2.7 kg) heavier than Atlantis and 363 pounds (165 kg) heavier than Endeavour. Part of the Discovery weight optimizations included the greater use of quilted AFRSI blankets rather than the white LRSI tiles on the fuselage, and the use of graphite epoxy instead of aluminum for the payload bay doors and some of the wing spars and beams. Upon its delivery to the Kennedy Space Center in 1983, Discovery was modified alongside Challenger to accommodate the liquid-fueled Centaur-G booster, which had been planned for use beginning in 1986 but was cancelled in the wake of the Challenger disaster. Beginning in late 1995, the orbiter underwent a nine-month Orbiter Maintenance Down Period (OMDP) in Palmdale, California. This included outfitting the vehicle with a 5th set of cryogenic tanks and an external airlock to support missions to the International Space Station. As with all the orbiters, it could be attached to the top of specialized aircraft and did so in June 1996 when it returned to the Kennedy Space Center, and later in April 2012 when sent to the Udvar-Hazy Center, riding piggy-back on a modified Boeing 747. After STS-105, Discovery became the first of the orbiter fleet to undergo Orbiter Major Modification (OMM) period at the Kennedy Space Center. Work began in September 2002 to prepare the vehicle for Return to Flight. The work included scheduled upgrades and additional safety modifications. Discovery riding piggy-back on SCA N905NA on the last flyover of the National Mall at around 10:15 am EDT, during its 11:05 am landing at Dulles airport on April 17, 2012. Discovery was decommissioned on March 9, 2011. NASA offered Discovery to the Smithsonian Institution's National Air and Space Museum for public display and preservation, after a month-long decontamination process, as part of the national collection. Discovery replaced Enterprise in the Smithsonian's display at the Steven F. Udvar-Hazy Center in Virginia. Discovery was transported to Washington Dulles International Airport on April 17, 2012, and was transferred to the Udvar-Hazy on April 19 where a welcome ceremony was held. Afterwards, at around 5: 30 pm, Discovery was rolled to its "final wheels stop" in the Udvar Hazy Center. By its last mission, Discovery had flown 149 million miles (238 million km) in 39 missions, completed 5,830 orbits, and spent 365 days in orbit over 27 years. Discovery flew more flights than any other Orbiter Shuttle, including four in 1985 alone. Discovery flew all three "return to flight" missions after the Challenger and Columbia disasters: STS-26 in 1988, STS-114 in 2005, and STS-121 in 2006. Discovery flew the ante-penultimate mission of the Space Shuttle program, STS-133, having launched on February 24, 2011. Endeavour flew STS-134 and Atlantis performed STS-135, NASA's last Space Shuttle mission. On February 24, 2011, Space Shuttle Discovery launched from Kennedy Space Center's Launch Complex 39-A to begin its final orbital flight. The launch of STS-41-D, Discovery's first mission. STS-121 launched on July 4, 2006 – the only Shuttle to launch on Independence Day. STS-119 on the night of March 11, 2009. Discovery sits atop a modified Boeing 747 as it touches down. Discovery lands after its first flight, STS-41-D. Discovery performing the Rendezvous pitch maneuver prior to docking with the International Space Station. The Space Shuttle Discovery soon after landing Modified Boeing 747 carrying Discovery. STS-124 comes to a close as Discovery lands at the Kennedy Space Center. Discovery's final touchdown on Kennedy Space Center's runway, concluding the STS-133 mission and Discovery's 27-year career. ^ a b "Space Shuttle Discovery Joins the National Collection". April 12, 2011. Archived from the original on January 21, 2012. Retrieved July 31, 2011. ^ a b c d "Space Shuttle Discovery Facts". Florida Today. April 10, 2011. ^ a b c NASA (October 2010). "NASAfacts Discovery (OV-103)" (PDF). Retrieved October 21, 2010. ^ a b c NASA (2007). "Space Shuttle Overview: Discovery (OV-103)". National Aeronautics and Space Administration. Retrieved November 6, 2007. ^ "10 Cool Facts About NASA's Space Shuttle Discovery | Space Shuttle Retirement". Space.com. Retrieved August 30, 2013. ^ "Discovery's last mission flight to space begun". February 24, 2011. Archived from the original on July 16, 2011. Retrieved March 9, 2011. ^ "Discovery's Final Touchdown A Success". redOrbit.com. Archived from the original on August 22, 2011. Retrieved March 9, 2011. ^ "Discovery (OV-103)". science.ksc.nasa.gov. Retrieved February 28, 2015. ^ "How Did the Space Shuttle Discovery Get Its Name?". Space.com. Retrieved February 28, 2015. ^ a b "Discovery (OV-103)". NASA/KSC. Archived from the original on June 10, 2011. Retrieved March 10, 2011. ^ a b c d "Space Shuttle Overview: Discovery (OV-103)". NASA. Retrieved March 10, 2011. ^ "Space Transportation System Haer No. TX-116" (PDF). NASA.gov. Retrieved February 28, 2015. ^ "STS-41D Press Kit" (PDF). NASA. August 1984. p. 13. Archived from the original (PDF) on March 15, 2013. Retrieved July 12, 2013. Graphite epoxy has replaced some internal aluminum spars and beams in the wings and in the payload bay doors. ^ Lardas, Mark (2012). Space Shuttle Launch System: 1972–2004. Osprey Publishing. p. 37. ^ Pearlman, Robert Z. "Space Shuttle Discovery lands, for the last time, in Washington, D.C." The Christian Science Monitor. Retrieved April 17, 2012. The air- and spacecraft duo landed at Washington Dulles International Airport at 11:05 am EDT (1505 GMT). ^ "Consolidated Launch Manifest". NASA. 2007. Retrieved October 10, 2007. ^ Bergin, Chris (2006). "NASA sets new launch date targets through to STS-124". NASASpaceflight.com. Retrieved October 15, 2007. ^ Chow, Denise. "Space Shuttle Discovery Lands on Earth After Final Voyage". SPACE.com. Retrieved March 10, 2011. ^ Pearlman, Robert (2008). "NASA seeks shuttle suitors: Museums may need to cover the costs for retired orbiters". collectspace.com. Retrieved December 17, 2008. ^ "NASA Solicits Ideas for Displaying Retired Space Shuttles and Main Engines" (Press release). NASA. December 17, 2009. Retrieved January 23, 2013. ^ Berger, Eric (December 7, 2009). "Discovery is Smithsonian's". Houston Chronicle. Retrieved January 3, 2010. ^ Pearlman, Robert Z. (March 17, 2010). "NASA Primes Retired Test Shuttle Enterprise For One Last Flight". Space.com. Retrieved March 14, 2011. ^ "news – "NASA readies retired test shuttle Enterprise for one last flight"". collectSPACE. March 15, 2010. Retrieved August 30, 2013. ^ "NYC, L.A., Kennedy Space Center, Smithsonian to get the 4 retired space shuttles". USA Today. April 12, 2011. ^ "Welcome, Discovery!". Smithsonian Air and Space Museum. Archived from the original on February 2, 2012. Retrieved January 30, 2012. ^ Associated Press/NBC Washington (January 24, 2012). "Udvar-Hazy Center Getting a 2nd Space Shuttle". NBC Washington. Retrieved January 30, 2012. ^ Dunn, Marcia (March 9, 2011). "Space shuttle Discovery lands, ends flying career". Salt Lake Tribune. Associated Press. Retrieved March 10, 2011. ^ Travis, Matthew (February 24, 2011). "STS-133 space shuttle Discovery launches for the final time". The Spacearium, SpaceflightNews.net via YouTube. Retrieved June 23, 2011. ^ "Shuttle Discovery takes off on its final flight". CNN. February 24, 2011. Retrieved March 10, 2011. ^ "NASA – KSC Names David King as Shuttle Discovery's Flow Director". www.nasa.gov. ^ KSC, Kay Grinter : (June 6, 2013). "Kennedy Biographies". Wikimedia Commons has media related to Space Shuttle Discovery. April 16, 2007: Consolidated Launch Manifest: Space Shuttle Flights and ISS Assembly Sequence. Space Shuttle Challenger was the second orbiter of NASA's space shuttle program to be put into service, after Columbia. Challenger was built by Rockwell International's Space Transportation Systems Division, in Downey, California. Its maiden flight, STS-6, began on April 4, 1983. The orbiter was launched and landed nine times before breaking apart 73 seconds into its tenth mission, STS-51-L, on January 28, 1986, resulting in the death of all seven crew members, including a civilian school teacher. It was the first of two shuttles to be destroyed in flight, the other being Columbia, in 2003. The accident led to a two-and-a-half-year grounding of the shuttle fleet; flights resumed in 1988, with STS-26 flown by Discovery. 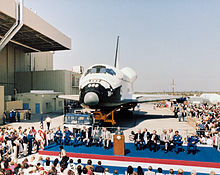 Challenger was replaced by Endeavour, which was built from structural spares ordered by NASA in the construction contracts for Discovery and Atlantis. Space Shuttle Atlantis is a Space Shuttle orbiter vehicle belonging to the National Aeronautics and Space Administration (NASA), the spaceflight and space exploration agency of the United States. Constructed by the Rockwell International company in Southern California and delivered to the Kennedy Space Center in Eastern Florida in April 1985, Atlantis is the fourth operational and the second-to-last Space Shuttle built. Its maiden flight was STS-51-J from 3 to 7 October 1985. Space Shuttle Endeavour is a retired orbiter from NASA's Space Shuttle program and the fifth and final operational Shuttle built. It embarked on its first mission, STS-49, in May 1992 and its 25th and final mission, STS-134, in May 2011. STS-134 was expected to be the final mission of the Space Shuttle program, but with the authorization of STS-135, Atlantis became the last shuttle to fly. Spacelab was a reusable laboratory developed by ESA and used on certain spaceflights flown by the Space Shuttle. The laboratory comprised multiple components, including a pressurized module, an unpressurized carrier and other related hardware housed in the Shuttle's cargo bay. The components were arranged in various configurations to meet the needs of each spaceflight. STS-31 was the 35th mission of the American Space Shuttle program, which launched the Hubble Space Telescope astronomical observatory into Earth orbit. The mission used the Space Shuttle Discovery, which lifted off from Launch Complex 39B on 24 April 1990 from Kennedy Space Center, Florida. The Space Shuttle was a partially reusable low Earth orbital spacecraft system operated by the U.S. National Aeronautics and Space Administration (NASA). Its official program name was Space Transportation System (STS), taken from a 1969 plan for a system of reusable spacecraft of which it was the only item funded for development. Operational missions launched numerous satellites, conducted science experiments in orbit, and participated in construction and servicing of the International Space Station (ISS). The first of four orbital test flights occurred in 1981, leading to operational flights beginning in 1982. STS-51-G was the 18th flight of NASA's Space Shuttle program, and the fifth flight of Space Shuttle Discovery. The seven-day mission launched from Kennedy Space Center, Florida, on June 17, 1985, and landed at Edwards Air Force Base, California, on June 24. Sultan Salman Al Saud of Saudi Arabia was on board as a payload specialist; Al Saud became the first Arab, the first Muslim, and the first member of a royal family to fly into space. It was also the first Space Shuttle mission which flew without at least one astronaut from the pre-Shuttle era among its crew. STS-27 was the 27th NASA Space Shuttle mission, and the third flight of Space Shuttle Atlantis. 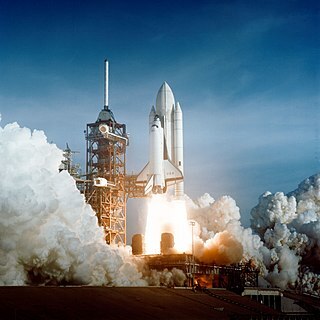 Launching on 2 December 1988 on a four-day mission, it was the second shuttle flight after the Space Shuttle Challenger disaster of January 1986. STS-27 carried a classified payload for the U.S. Department of Defense, ultimately determined to be a Lacrosse surveillance satellite. The vessel's heat shielding was substantially damaged during lift-off, impacting the right wing, and crew members thought that they would die during reentry. 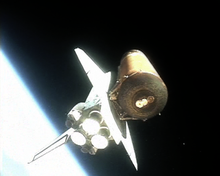 This was a situation that was similar to the one that would prove fatal 15 years later on STS-107, but compared to the damage that Columbia had sustained on STS-107, despite Atlantis experiencing more extensive damage than Columbia had sustained, the damage was over less critical areas and the missing tile was over an antenna which gave extra protection to the wing. The mission landed successfully, although intense heat damage needed to be repaired. STS-33 was a NASA Space Shuttle mission, during which Space Shuttle Discovery deployed a payload for the United States Department of Defense (DoD). STS-33 was the 32nd shuttle mission overall, the ninth flight of Discovery, and the fifth shuttle mission in support of the DoD. Due to the nature of the mission, specific details remain classified. Discovery lifted off from Pad B, Launch Complex 39 at Kennedy Space Center (KSC), Florida, on 22 November 1989 at 7:23 pm EST; it landed at Edwards Air Force Base, California, on 28 November. STS-109 (SM3B) was a Space Shuttle mission that launched from the Kennedy Space Center on 1 March 2002. It was the 108th mission of the Space Shuttle program, the 27th flight of the orbiter Columbia and the fourth servicing of the Hubble Space Telescope. It was also the last successful mission of the orbiter Columbia before the ill-fated STS-107 mission, which culminated in the Columbia disaster. Space Shuttle missions designated STS-3xx were rescue missions which would have been mounted to rescue the crew of a Space Shuttle if their vehicle was damaged and deemed unable to make a successful reentry. Such a mission would have been flown if Mission Control determined that the heat shielding tiles and reinforced carbon-carbon panels of a currently flying orbiter were damaged beyond the repair capabilities of the available on-orbit repair methods. These missions were also referred to as Launch on Demand (LOD) and Contingency Shuttle Crew Support. The program was initiated following loss of Space Shuttle Columbia in 2003. No mission of this type was launched during the Space Shuttle program. Joan Elizabeth Higginbotham is an American engineer and a former NASA astronaut. She flew aboard Space Shuttle Discovery mission STS-116 as a mission specialist and is the third African American woman to go into space, after Mae Jemison and Stephanie Wilson. The Space Shuttle orbiter is the spaceplane component of the Space Shuttle, a partially reusable orbital spacecraft system that was part of the Space Shuttle program. Operated by NASA, the U.S. space agency, this vehicle could carry astronauts and payloads into low Earth orbit, perform in-space operations, then re-enter the atmosphere and land as a glider, returning its crew and any on-board payload to the Earth. STS-135 was the 135th and final mission of the American Space Shuttle program. It used the orbiter Atlantis and hardware originally processed for the STS-335 contingency mission, which was not flown. STS-135 launched on 8 July 2011, and landed on 21 July 2011, following a one-day mission extension. The four-person crew was the smallest of any shuttle mission since STS-6 in April 1983. The mission's primary cargo was the Multi-Purpose Logistics Module (MPLM) Raffaello and a Lightweight Multi-Purpose Carrier (LMC), which were delivered to the International Space Station (ISS). The flight of Raffaello marked the only time that Atlantis carried an MPLM.